Behind the scenes, it looks a lot worse: the preconstruction market is in the process of unraveling. A total of 4,525 condos were completed between 2012 and 2016 at 20 large projects (80+ units each). Of them, 878 “preconstruction” units are now listed for sale by investors who’d bought from developers before construction began – 19% of the total units in those projects! At the 234-unit Marina Palms North, completed a year ago, 93 units are for sale. But only 47 resales have actually occurred over the last six months. This makes for a supply of 112 months, or nearly a decade, at the current sales rate. At seven of those developments, with a combined 209 units listed for sale, no sales have occurred over the past six months, and the months’ supply would be infinite. Of those 47 sales, 43% produced net losses after commissions. Now even more flippers are willing to take a loss: 70 units have been listed with underwater asking prices, up from 44 on August 1 and from 14 on May 1. But losses will be higher: 30% of the units that were sold at a loss had asking prices above break-even. And it will spread from there: These losses are establishing a down-trend in the “comparable sales” data – the Holy Grail by which the industry values properties – which will depress future asking and sales prices further. Just then, new supply will flood the market. Over the next 24 months, another 10,328 units at large developments are scheduled to be completed. If the recent average of 30% to 40% of these new units is listed for resale, it would add another 3,614 units to the list, on top of the 878 units of 2012-2016 vintage listed today. This would increase the supply to 468 months at the current sales rate. That would be 39 years’ supply!! At the five large developments completed between August 2015 and June 2016 with a total of 912 units, 156 units are for sale. Developers still own 123 units. Only 25 of them are listed for sale and are included in the 156. The remaining 98 developer-owned units are not listed for sale. Developers are just sitting on them. It’s the shadow inventory. The units listed for sale and the shadow inventory combined amount to 254 units, or 28% of all units in the developments. Some developers have not repaid their construction loans, others have taken out bridge loans. Developers are also responsible for taxes, maintenance fees, and insurance of unsold units. What will developers do to liquidate unsold units? Market gurus are eagerly proclaiming that this time, the condo cycle is different because preconstruction condos are sold with a “50% deposit.” But this isn’t a 50% deposit. It’s a series of five 10% progress payments due at at the time of reservation, at contract, at groundbreaking, at concrete-pour at the 15th floor, and at Top Off. They typically spread over 24 months. When a buyer defaults on a progress payment in this market, with little possibility of selling the unit, everyone from the lenders to the developers is bending over backwards to accommodate the nonpayment. Also, alternative lenders have sprung up with loans for the defaulted progress payments. The actual number of defaults is a secret closely guarded by developers (though their lenders know). But when the project is completed and the buyer with defaulted progress payments attempts to get a mortgage to finalize the purchase, which is what the developer wants to happen, the bank sees the defaulted progress payments along with the stress in the condo market and might not offer a mortgage. This is when the whole deal falls apart, even as the buyer is in arrears with the progress payments. Hence, the value of that “50% deposit” to bail out the developer can be minimal. And now the ultimate nightmare has happened for preconstruction condo flippers: The first big condo project in the area has stalled in this condo cycle, “which could be a sign of things to come,” Stearns says. In September, the developer of the 247-unit H3 Hollywood ran out of funds and halted construction halfway into it. This is in Fort Lauderdale, Broward County, which is adjacent and to the north of Miami-Dade County. While they’re different markets, this incident is a harbinger of what may occur in Miami. Foreclosures suddenly spike most since the last Housing Bust. Read… What the Heck’s going on with Foreclosures? Why this Spike? They recently started construction on a 30 acre project in Miami called the World Center. It is a mix use monstrosity of a project to add to the overbuilt malls and condos. I have no idea who would want to buy in Miami these days because the quality of life there is very poor. Too much traffic, homelessness, expensive, and too many immigrants to be cool anymore. 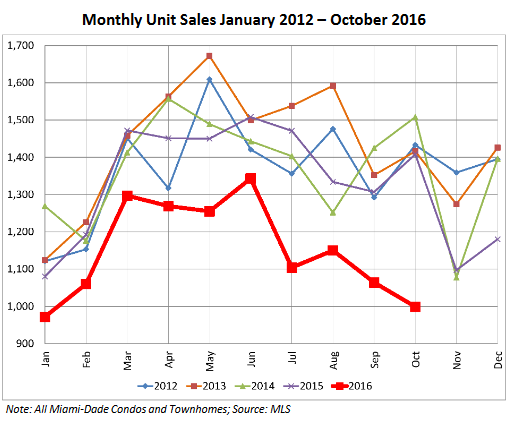 As far as the condo in Ft. Lauderdale, in the last few years they built a glut of rental apts up and down US1 (the main drag in the area). These apts are small and expensive, and I’ll bet there is glut in this sector as well. The rental apt expansion goes well north all the way to Boca Raton and beyond to West Palm Beach. The Trump win may save Palm Beach County from the same fate as Miami. BTW, they are reporting that foreclosures are up in New York City. That’s a really bad sign because the real estate market in NY is always very tight. Unexpected by whom, pray tell? I’d say something expected will happen to the market – increased flooding… of water. Once one of these condo developments goes underwater in the sense of water flooding portions of the site, or sea water infiltration of the water table killing off the landscaping, and the exodus will begin. Leonardo DiCaprio bought, for about 2 million dollars, Blackadore Cay island, which sits from 1 to 3 feet above sea level and which is to be an ultra-luxury eco-resort/development. I thought he knew about these things … but maybe the water will rise everywhere else, just not there. No, he’ll just blame Hillary Clinton for the flooding – probably caused by her e-mails, or BENGHAZI!!!!! The same crowd which didn’t see the Freddie Mac and Fannie Mae meltdown in 2008 and the SHCOMP catastrophe last year. 1) There will be NO questions asked about where the funds come from for any purchaser. Any purchaser gets a green card and path to AMERICAN citizenship after 20 years residency, (the Gold Standard), for the purchaser, but no Daisy Chain Migration ). You will have MILLIONS of Chinese and South Americans buying if they know they can get into America (the GOLD Standard). Better than the sewer of Asia of South America. 2) The purchaser will be guaranteed a VISA into America. Also, they can establish a US based Bank Account for all deposits. If we do this, we will have no problem with Miami/Dade condos. I would like to add that if the purchaser has a net worth over $1 Million (US) or can deposit this in an American based bank, then the the rules should be easier. One thing I would like to add, those under this program have NO VOTING rights in any election and can only reside here to escape the wonderful socialist/democratic/leftist hell they are leaving. Certain types of real estate “investments” – buying certain types of preconstruction condos in special buildings, for example – already qualify foreign investors for the green card. Happening in Oakland and elsewhere right now. That has been going on for years. Other investment visas exist too. For those with money, it has always been fairly easy. Does this have any significance in (numbers) for the total US RE market? Many EU countries have introduced similar ‘residence permit for RE investor’ regulations after 2008, but I hear very little about it. Maybe that is because those who want to move to mainland Europe come for the free-everything-forever-without-any-obligations, and those are not the type of persons who have money for a home lying around, or plan to work to pay off a mortgage. Another reason we don’t hear about it could be that the people who DO have the money prefer to keep things silent, because the money is coming from less legitimate sources etc. or in some countries because it might attract unwanted attention (in some cases only expensive RE qualifies). Is that how much it costs now? I thought Malta offered a much better deal. You mean like the social democracies of Europe. where the citizens together pay for health care, education, and retirement benefits for all. You mean that hell? Or perhaps you are speaking of oligarchic dictatorships where the one % control all wealth and power. Sound familiar? Can we survive an administration based on hate fear and ignorance? We can do this! My point? Others my wish to come here, and they may help in overcoming this regression to the 19th century. How could this be? Isn’t the whole Trump thing supposed to Make (Insert a Noun here) Great Again? I have a feeling that we are very near the top now. The market is going crazy because they finally realize, this is the last hurrah. I am 27 and my youtube is blowing me up with nonbank lenders trying to sell low down payment mortgage since late summer this summer. I figure that in under a year, my condo will be a lot more affordable with owner a lot more willing to sell it. Just hot to sit tight. There was a tremendous south Florida land asset bubble in the early 1920s, which imploded spectacularly. We are seeing a repeat of that asset bubble and implosion in 2016/17, based on grossly excessive condo and commercial overbuilding, perhaps on an even larger scale. There appears to have been two major failures: (1) The lenders did not perform (or did not act on) adequate “due diligence” with respect to capacity v need (which was to be expected with the NZIRP and resulting search for yield no matter how phantasmagorical); and (2) the mis-, mal- and non- feasance of the municipal zoning and building permit authorities, which allowed, indeed in many cases promoted, the gross over-building despite the clear and unequivocal adverse impact such overbuilding has had in the past on existing property values and community character/ambiance, the maintenance of which is the basic justification for the existence of zoning regulations and the permitting process. While the individuals directly involved, e. g. the contractors, financiers, “investors,” etc. will be severely impacted by the bursting bubble, the collateral damage inflicted on the general population, including small businesses, will be even more severe and several times as great, lasting far longer, for example having been priced out of local housing during the bubble expansion, and then forced to make up the governmental tax revenue shortfalls created by the contraction in local real estate valuation, but also to pay off the municipal bonds for the infrastructure and amenities demanded by the over-building such as roads, schools and professional athletic facilities. In Florida real estate construction is considered a major industry and is always divorced from demand. Their attitude is “if you build it, they will come”. The only thing that interferes with more building is financial collapse. As far as investors walking away, it depends on how you define “investors”. 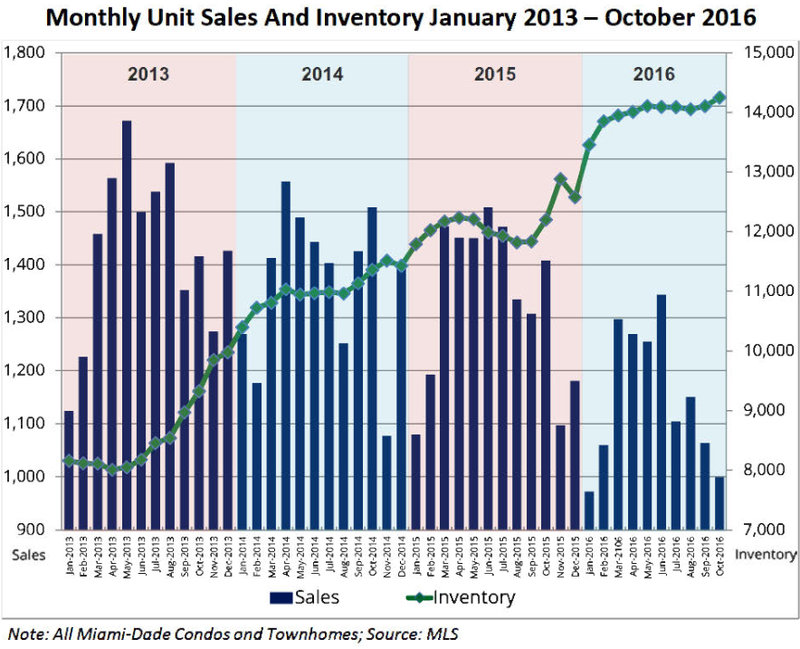 In Miami many new condos are flipped at a loss because it is a good way to launder money. It goes in dirty and comes out clean. The haircut in those situations are a cost of business to that “investor”, but it kills value for the other owners. In an interesting development, yesterday the SEC fined some ex Miami official, for fudging the facts on some local bond deals. Apparently he thought of this all by himself. This is actually funny for more reasons than you even want to know about. When almost every major market has more units being built than in the last 30 years it is obvious housing bubble 2.0 is happening .Maybe this time people will learn something , yeah right LOL.I also see this trend in non major markets like Kansas City . Here in Texas I haven’t seen or heard of any pressure on housing, until this month when two independent acquaintances mentioned they were going into foreclosure. One was an oil business worker and the other was local government worker. Both acted surprised but it takes 120 days of non-payment to start foreclosure proceedings. More impact when it is this close to home. It is the same thing in Thailand. There are thousands of empty condo’s, apartments and rooms everywhere. And not just in the cities as you can drive out in the country and on reaching an intersection there will be a row of either 2 story or 3 story attached condo’s. The bottom floor normally has a roller door which assumes a business will open and then the family will occupy the next floor/s up. At night time in the city all you need to do is go for a walk and notice all the buildings in darkness. In mpst cases meaning the place is empty. I have no idea if the Thai Government offer tax breaks or low interest rates to its citizens to cause all this building activity or maybe people are following the story that the world’s population is growing. Maybe instead the world’s population is aging and there are less young people. I was going to say that the cost of living in Thailand is cheaper than the Philippines but on second thoughts its only cheaper because there is more work here. However if you are retired or retiring you will not be affected by whether you have work or not and then based on that I would (personally) choose the Philippines because the cost of visa’s is less and the amount of money you need to have up front (in the bank) is less in the Philippines than in Thailand. I would put both medical set-ups on the same basis. I don’t know about insurance plans in Thailand but in the Philippines you have PhilHealth which for about 10,000 peso per year will give you hospital/medical coverage. There are many factors to the ease (or not of retiring in this part of the world) because factors of whether you are married to a Filipino or Thai Citizen come into the equation. My wife’s family is from the Philippines – Pangasinan, about four hours north Manila – and I just returned from a visit there, the first in three years. The increase in high-rise development in Manila was striking, and in the provinces there were also many more new buildings, which appeared to be private homes built by Filipinos working overseas. Many new vehicles on the roads, and a greater sense of overall prosperity. Despite its many problems – corruption, very bad air pollution, even in remote areas, since people burn their garbage, and transportation fuel is diesel – I love the country and its people, and have considered at least wintering there when I retire, but at the moment they seem to be in a bubble, too. Also at around $200.000 US dollars per year, their health insurance sounds pretty appealing. To Michael Fiorillo: 200,000 …. whew. You added one too many zero’s as 10,000 peso equals US$200. 200 from 200,000 sure leaves a lot of change left over. Yes I love living in the Philippines. I couldn’t handle Manila but I live down in Mindanao and contrary to all the stories you read and hear I personally have never had any problems and I’ve lived there since 2008….although currently I am here in Thailand. The diversity of plant, insect and animal life is never ending compared to New Zealand where I come from. Example: Dragonfly’s come in colours of blue, green,, red, orange, irridescent. In New Zealand dragonfly’s are one colour…… black. Ants: Red, black, large, small, tiny, miniscule. In New Zealand ….one colour, black. You can plant and harvest vegetables 4 times a year in the tropics. In New Zealand is just one harvest per year. I read these blogs about life in Western society and wonder why people endure such trauma and stress. But having no experience with Thai or Philipino culture or relatives in the area it might be tough moving there – unlike New Zealand which is used to immigrants, although the immigration policy is complicated if you are self-employed. Regarding housing bubble, someone who lives there most of the year told me around 2005 that parts of Thailand had a serious housing bubble for the more attractive homes that people from the West would like; prices seemed not much lower than in much of Europe (or New Zealand) but difficult to check from afar. When Thailand had a crisis back in 1998, empty condos was a symptom as well. I think I am going to put a short on the Thai baht soon. I have been an expat in Asia for over 30 years, the last 14 in Thailand where I am retired. I would recommend the utmost caution in buying property here, or anywhere in ASEAN outside of Singapore. Personally I rent one of the shop houses you describe Ricardo in a quiet fishing town on the west coast of the gulf of Thailand 3 hours from Bangkok. Monthly rent 4,000 baht, US$113 at today’s rate. The place is huge and I live stress free, ultra cheap medical, rent a car when I need one. I ‘got out of the system’ before Jim Sinclair had even thought of the term and live very happily as a result. I’m curious about “ultra cheap medical”. Could you explain? thanks. I think you nailed it Bob,was planning on renting first ,since i am allergic to stress as well! you would not believe how much i am looking forward to trading my 2 hour I- 5 commutes with a hammock on the beach,getting out of the system as you say! High rise condos seem to have a special place in the real estate world. How many of us have seen them at night with almost no lights on in the whole building? Whether it be Panama, San Francisco or San Diego. Laundering money and/or hiding money seem to be likely reasons. It’s not just in China anymore. It’s all money laundering in one form or another. The bank counterfeits credit based on over valued assets then puts it into these development projects that turns into money for all those taking a piece, from the real estate agents, down to the subs…. My country has very few high rises, but a nearby seaside town has a few and most of these luxury apartments are dark every night and the underground car park is almost empty. Has been like that since they were built around 2000, probably over 70% is purely ‘investment’ and not actually used. In my country this has worked out very well for the investors, because property taxes are close to zero, gains from selling a home are tax-free and unlike e.g. a savings account money in RE isn’t taxed. Despite some hiccups in RE prices after 2008, most owners probably gained loads of money just by sitting on their apartments. Some of this might be hiding money, but even if the money is legal it is attractive compared to many other investments due to government policies. And we don’t need foreign speculators for this, most of the owners are probably Dutch with a few from Belgium or Germany. Trump bought the Doral resort in 2012 .It is located about 15 miles west of Miami Beach.While it is primarily a golf resort.,there is enough land to build thousands of condos.Looks like these condos will never be built. We have rents rolling over, and single-family prices rolling over here in Houston, as the economy remains on recession’s doorstep. No shortage of luxury apartments in the Bayou City because the pundits were banking on a surge of millionaires flocking to the Houston housing market. Now, instead of all of those good paying engineering jobs, we’re adding a boatload of leisure and hospitality, retail. Unfortunately that cohort won’t be able to afford our sky-high property taxes. Why would anyone buy a condo when it will be sitting in water at high tide in just a few years if it isn’t already? Please, stop. Florida is at sea level and the sea is not rising. You can go up and down the coast line and see beachfront condos built in the 50’s and 60’s exactly the same distance from the beach as they have always been. Stop reading all that liberal nonsense. The sea is definitely rising over here in Netherlands, so it must be rising in the US just the same. The average changes per year are small compared to daily fluctuations, but it all adds up. Half of Netherlands could be under water before the end of the century and that isn’t even the worst case prediction. BTW, I do remember reading about expensive beach front properties (from the 50’s or even earlier) somewhere in Florida that were recently rebuilt or adapted to counter frequent flooding. Petunia, I responded to your post below and included a chart. The column was too narrow to do this here. So please check my comment below. So here’s the chart. Click on it to enlarge. 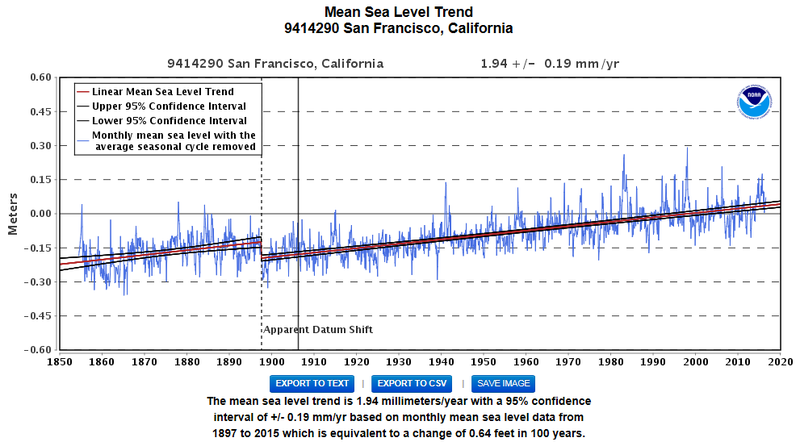 Also note that water being water, the sea level is rising everywhere, not just in the SF area. You can get this data for other locations too, though the historic data might not go back that far. I will respectfully disagree with you and encourage you to seek out information on the income sources of the scientists that produce the climate change/global warming/CO2 data. An investigation may lead all the way back to Wall Street and the usual suspects that will profit from even more derivatives on the market. It’s been decades since I worked on Wall St. and even then they were formulating the agenda. I will give them credit, where credit is due, because I never thought they could get people to believe this stuff, and they did. I understand. Please note that the chart has nothing to do with climate change or CO2. It is just a chart of water levels, based on data collected over 150 years. What conclusions you draw from the data – for instance, what caused water levels to rise – is up to you. There are a lot of good explanations out there that you can see with your own eyes. For example, during the summer months, you can now go by ship through the “Northwest Passage” – the sea route connecting the northern Atlantic and Pacific Oceans via the Arctic Ocean – for the first time in the modern era. Why? Because the ice has melted. This is happening. The big ice caps in the north and south are melting rapidly. You can see the difference over the past few decades if you go there and look at it. And the water has to go somewhere. My explanation for the rising sea level in San Francisco is that actually San Francisco is sinking due to the tectonic environment. It is a nonsense to say that CO2 causes global warming as the amount of CO2 in air is extremely small at 400 ppm, which is abot 0.04 %. You can ask any chemical engineer that this kind of gas concentation cannot have any impact of heating capacity of a gas. Here in London we have one of the coldest autumns I can remember. When is global warming finally coming? It seems you forgot to add the /sarc tag. 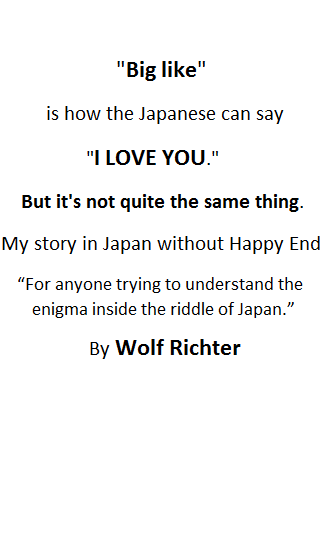 I’m enjoying the comments as much as the Wolf Richter articles.